BasicQ Inc. -- Kirsch Drapery Hardware 1 3/8"
Kirsch Wood Trends Collection is available in three unique collections, Classics, Urban and Renaissance. 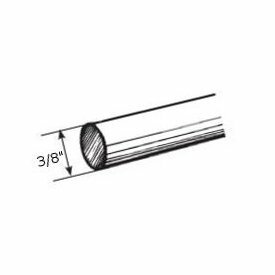 Four, six, eight and twelve foot lengths are available with the two inch and one and three-eights inch wood rods. The components, brackets, rings and finials, are color coordinated with the style you select. Nice selection of finials to finish your treatment off, and four types of brackets for moung to wall or ceiling. Bay and corner windows can be covered by using the swivel socket available in each size. Twelve foot rods have to be shipped by truck which is not covered with the free shipping policy. Two rods can be connected with the 5610eo-061 connector screw for extra wide windows or for shipping purposes. A support bracket will be needed at the connection point. 1 3/8 inch round wood bracket 4 1/2"
Decorative traverse rod set 28-48" projects 3 1/2" to 4 1/2"
Decorative traverse rods 66-120" two-way draw 1 1/2"
Alexandria decorative drapery curtain rod crown finial 28-48"
Alexandria decorative curtain rods crown finial 48-84"
Alexandria , decorative curtain rods crown finial 66-120"
Alexandria , decorative curtain rods, crown finial 84-156"
Alexandria large window decorative curtain rod crown finial 130-240"